The Epson Workforce WF-2520NF is a compact 4-in-one unit ideal for home or office environments. It produces quality documents that are smudge- and water-resistant and documents will not blot even when struck through by a highlighter. 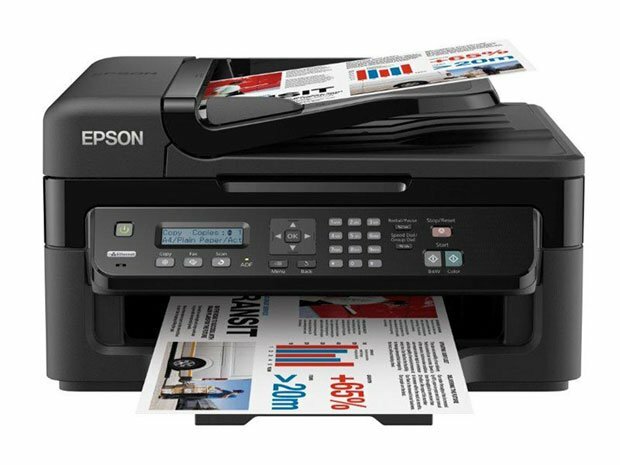 The Epson Workforce WF 2520NF printer offers versatile connectivity allowing users to share the printer over a network of computers. It offers high-capacity inks and supports colour and monochrome printing. However, colour print rates are not as impressive, averaging only 18 ppm. The Epson Workforce WF-2520NF leaves a very small footprint, measuring only 39x37x22 cm. It incorporates a printer, scanner, copier and fax machine and it features its own automatic document feeder that allows automatic 30-page scanning, copying and faxing. The WF-2520NF colour printer features a built-in Ethernet interface and when connected to a WiFi router, the unit is able to print wirelessly from compatible devices like tablet PCs and smart phones. In addition to its compact design and impressive feature set, the Epson Workforce WF-2520NF colour inkjet printer also boasts flexibility when it comes to media handling, featuring a 100-sheet input tray that takes on a wide range of media. The Workforce WF2520NF 4-in-1 can print as many as 3,000 pages per month and when used with quality ink, prints last a lifetime. On the other hand, the Epson Workforce WF2520NF does not offer impressive colour print rates. The Epson WF-2520NF printer can only produce as many as 18 coloured pages per minute, even slower when printing complicated documents. Black and white printing, however, is impressive, averaging 34 pages per minute.